Sony TV’s The Kapil Sharma Show has been hitting the headlines since its inception. The show has impressed the viewers and is one of the top shows on the TRP chart. Many celebrities have graced the show to promote their shows and films. 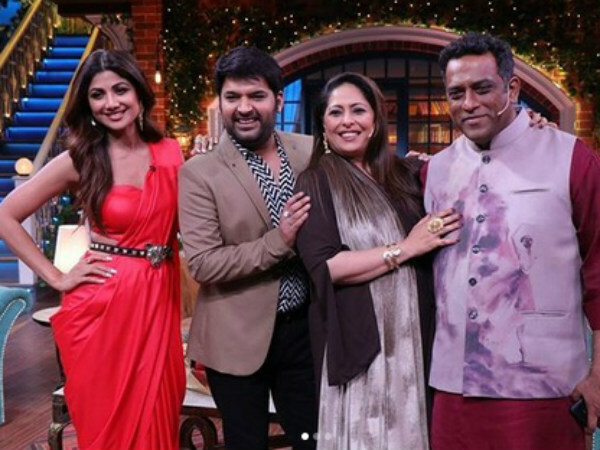 Recently, Super Dancer 3’s judges, Shilpa Shetty, Anurag Basu and Geeta Kapoor, graced the show. On the show, Kapil posed an interesting question to the guests. He asked the celebrities about the weird demands from their fans at their wedding functions. This question prompted Navjot Singh Sidhu to force Kapil to reveal about his unexpected and seemingly weird moment that happened to him during his wedding. Kapil then narrated an incident when one of his crazy fans gate-crashed his wedding in Amritsar and annoyed him with his behaviour. Kapil revealed about a drunkard, who attended all his wedding functions. While Kapil was busy with his wedding processions, the man used to get closer to him and kept kissing on his neck to congratulate him. The comedian revealed that he got so annoyed with the man’s behaviour that he nudged him hard to shoo him away. After which, he never came back again. When Shilpa asked whether Kapil could recognise the person, he said that he is still unaware of the man’s identity.